Seattle's reputation for seafood is well-known, but it deserves equal renown for the Ethiopian restaurants, pho shops, and noodle joints that pepper the town. The potpourri of dishes, cuisines, and ingredients that makes up Seattle's best restaurants shows off the city's strength: improving just about anything with a little bit of Northwest vision. 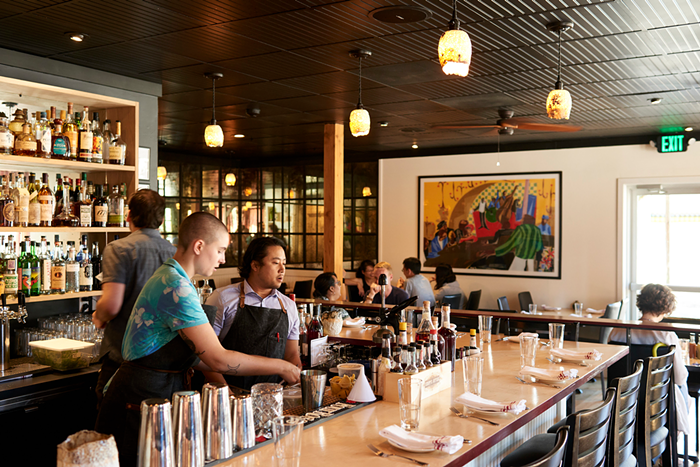 That might mean drinking Vietnamese soup with a shot of whiskey, digging into injera in an old craftsman, slurping soba noodles with spot prawns, or sprinting out of dinner to catch the last ferry—the city can't help but season its best restaurants with a unique Seattle flavor. Oysters, mussels, scallops, and more come straight from the sea to these stylish shellfish bars. Designed to provide diners with a first-rate seafood-eating experience, the cool marble surfaces greet great platters of freshly shucked bivalves on ice, seaweed-thin shavings of impeccable fish, and the kinds of wine, beer, and cocktails that complement a salty sea of flavors. Though the mini-chain is relatively new, the shellfish all comes from the family company's fifth-generation farms just outside the city. The bars are as much galleries of the Northwest's natural bounty as they are places to grab a bite to eat, especially with dishes like the Salish Sampler, a shucker's dozen of raw oysters, geoduck, yellowtail, scallops, and prawns that takes diners through the region's best and brightest seafood in its purist form. Absence makes the heart grow fonder, and that's what happened to chef Max Petty when he left the area and earned his chef chops in that other Washington. When he returned to Seattle, he built a restaurant that combined his cutting-edge culinary mind-set with the ingredients that flavored his childhood. Washington wild onions dress steak as part of a chimichurri, d'Anjou pears garnish his signature pig-head candy bar, and black-cod mousse graces a tartine. The sweet, small space includes cozy window-nook tables, a sleek bar, and floral wallpaper—a welcoming neighborhood feel for a place putting out world-class dishes. Stunning presentations and intricate preparations set a breathtaking table, whether ordered from the small à la carte menu or paraded out as part of the chef's or grand tasting menus 7 and 15 courses, respectively. Though Seattle rarely rates for fine dining, Altura bucks the trend and brings a flight of fancy to the city's scene. Scooping up the most interesting fish, fowl, and forest-foraged goods, chef Nathan Lockwood transforms them into an Italian multi-course tasting menu bolstered with hints of luxury, like truffles and caviar. From the open kitchen, the chef and his crew create savory cannoli, cedar- and madrone-grilled frutti di mare, and asparagus tortelloni flavored with runny La Tur cheese. The intimate setting brings diners close to their companions, and the excellently paired beverages—which range from cider, sake, and spirits to more traditional wines—bring them even closer. What if the tale of the South were told with the voice of the Pacific Northwest? That's the story chef Edouardo Jordan tells with his cooking at Ravenna's JuneBaby (which just won a James Beard Award for Best New Restaurant). Raised in Florida, trained at New York's and Napa's finest French restaurants, and cooking from a kitchen right here in Seattle, he combines the flavors of his childhood with the skills of his adulthood, bringing diners on a journey from pimento cheese with house-made saltine crackers to smoked carrots with collard greens, tahini sauce, and benne seeds. Southern-fried comfort food like catfish and grits comes embellished with local fiddlehead ferns, and Jordan's oxtails come alongside king trumpet mushrooms and nettles. The only thing sweeter than the service is pastry chef Margaryta Karagodina's desserts: root-beer floats, sweet-potato pie, and hummingbird cake. When Ethiopian refugees first arrived in Seattle in the 1980s, they had to replicate the traditional teff-based bread with self-rising flour. Today, mini-marts around the city sell real injera made with teff, and a plethora of restaurants compete for the best vegetable platter in town. Few approach Meskel, which also wins for ambience. Carved out of the main floor of a classic Seattle craftsman house, the restaurant offers the homey feel of eating at an Ethiopian friend's home, complete with a grill on the outdoor patio. While upstairs, diners sip coffee and dig into kitfo (Ethiopian steak tartare), the basement bar serves the same menu with a projector television nearly always programmed to soccer. Order a whiskey or a Harar beer and make yourself at (a different sort of) home. In 1982, Quynh, Khoa, and Yenvy Pham's parents opened Seattle's first pho shop. Today, you can hardly go a few blocks in Seattle without seeing pho, and the now-adult children have pioneered their own business: a bigger, better pho shop right behind their parents' original one, with the neighborhood's first cocktail bar. Modern and trendy, with an epically Instagrammable sign declaring this the "Pho-cific Northwest," the shop sells bowls of pho with Flinstone-esque short ribs sticking out, "unfortunate" cookie mix, and a shot of whiskey washed down with pho broth. But at its root, it isn't all that different from the original Pho Bac next door—serving really good pho to a city that loves the Vietnamese noodle soup. In a restaurant so small that the noodles, made fresh each day, have to be rolled out in a closet, Mutsuko Soma creates magic in the form of soba noodles and tempura. She didn't set out to be a soba noodle making master, but when she discovered that the buckwheat used to make her beloved grandmother's dish was mostly grown in her adopted home state of Washington, she leaned in to fate and headed to soba school. Now she marries the old-school noodle making technique with local ingredients, and uses her own wildly creative culinary mind to produce dishes like sake poached shrimp on foie gras tofu and curry mozzarella soba bowls. No visit to Seattle is complete without a boat ride of some sort, and what better reason to hop a ferry than dinner at Hitchcock? A short walk up the hill from the Bainbridge Island ferry terminal, Brendan McGill's culinary ode to the island shucks oysters, smokes salmon, and serves a whole menu of specialties sourced from the great nearby. The eminently affordable tasting menus provide a refreshing and full look at the island, from stinging-nettle soubise on steak to citrus fumet with mussels, alongside à la carte options. And the friendly servers keep an eye on the ferry schedule to make sure everyone gets home on time. The brainchild of French-trained Korean American chef Rachel Yang, Revel brings big ideas and flavors to small plates, pancakes, and rice bowls. Temporarily relocated from its original Fremont home, the restaurant is winning over South Lake Union with its corned lamb salad, pork belly and kimchi pancakes, and short rib rice bowls. Few of the dishes from the lunch and dinner menu even call for the quartet of house-made hot sauces that grace each table, given the boisterous flavors that come from touches like chipotle apple pickle on the char siu pork dumpling, and spicy red chimichurri on the grilled trout. In between meals, the happy hour menu features a few more casual—but no less flavorful—options, including spicy Korean ramyun and a kalbi burger. Pasta master Mike Easton's brilliant daily noodle specialties keep the crowds lined up, necks craning to see what three items make up the menu that day. The pappardelle alla Bolognese rarely comes off the menu, and regulars know that Friday will bring a baked pasta, but in between is anyone's guess: torchiette with asparagus, lemon, and walnuts in a cream sauce scream of spring; campanelle—little bells—ring in summer with sweet corn, basil, butter and a hint of chili peppers; cozy cavatelli with Calabrian chilies, clams, and chorizo comfort in winter; and black spaghetti celebrates fall with heirloom pumpkin sauce and fennel-toasted pumpkin seeds. With each day comes a new menu, but fans of the Pioneer Square sliver of a spot know the routine: weekday lunch only, come early for the best choices and shortest line, and order before you sit down. Other than that, there's no way to go wrong—whatever you order, you're about to get the best pasta $10 can buy. Get to know all the most important neighborhoods in the Emerald City.